28mm Victorian Warfare: When shall we three meet again? More supernatural shenanigans for the 'Witchfinder' project; once again, I seem to be taking things out of sequence, but these proved just too difficult to resist. I believe that they are 'Wargames Foundry' sculpts from their Undead range, now available through 'Flyte of Fantasy' on eBay. Fabulous fun to paint, these John Pickford sculpts are quite sizeable and will dwarf 'Warlord Games' miniatures, but should fit perfectly with the 'Redoubt Enterprises' ranges, I will eventually get around to posting a comparison shot at some time. In other news, I'm struggling with Blogger again; having lost my blog roll, I am now reduced to only seeing one blog at a time in my reading list. I have tried reloading the page and opening it it a different web browser, but to no avail. This is most infuriating as I know I must be missing an awful lot of posts, in fact I am not sure that this will be seen by anyone! If anyone does know of a fix, do please let me know! What a horrid bunch of witches! They really do look super, well as super as a witch can be. Great work. Thank you Clint, really enjoyed these! I love your new friends, they are so cute...what about a dinner with them soon? I'll see what they are doing at the weekend Phil, looks like pea soup on the menu! The Blogger Dashboard problem is widespread. I've had it for a few days, but it seems to have cured itself in the last hour or so. Agreed. I had the single item in the reading pane for days and now suddenly it's working correctly again. Thank you both, all seems to be well again with the blogging world. When the battle's lost and won"
What an enchanting group of figures Michael. Oh sorry Tamsin, I didn't want to copy your comment. I had the comment form open for a while and didn't recognize your post. 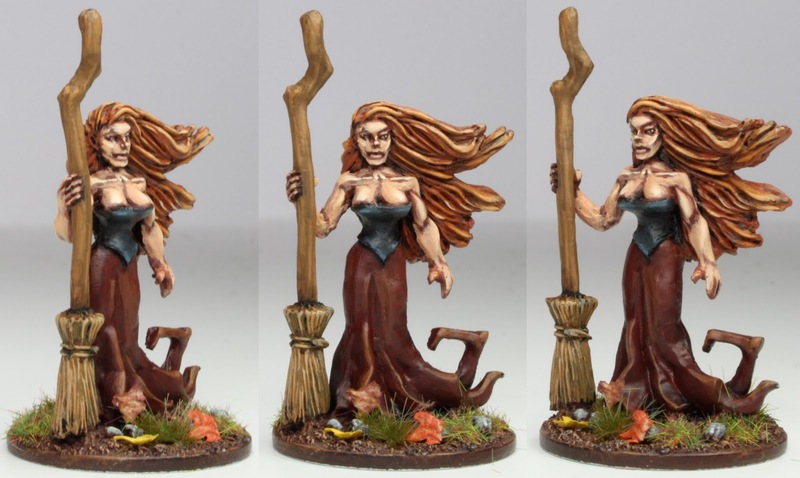 The posture of the brown witch looks a bit strange to me but your paintjob is flawless as usual. 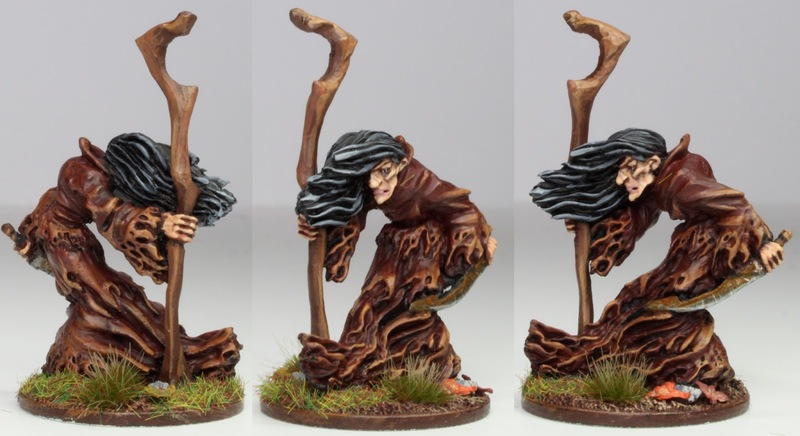 Thank you Stefan, I quite like the brown witch's windswept look. Thank you mark and what a great idea! Nice group of witches Michael. The colours used are so vivid! Don't worry about the Blog roll, it will be resolved (by itself) in a couple of days. Thank you Thanos and you were right about the blog roll all seems to be back to normal. Excellent as always michael . Terrific work on those, Michael. I love the bubbling green stuff in the cauldron. Thank you so much Giles, not sure what the green stuff would be, I keep thinking pea soup now. Boils and bubbles excellent work Michael! Wonderful! Thank you so much, brought a smile to my face Sir. Superb renditions as always and will be good (evil ?) opposition to the forces of good. I have had similar problems with blogger over the last three days, but it has been fixed. Thank you, and you were right all seems fixed now. Awesome work on these Michael! Lovely highlighting! Great looking witches. Brings back memories of seeing Patrick Stewart as MacBeth at Chichester a few weeks back. Thank you Peter and I bet that was a great show - lucky chap. I see the British love of brewing tea extends to their witches as well. I do so love their tea kettle is so Disney gone wrong. They are truly weird and wonderful. Thank you Robert, everything stops for tea even cursing and potion making! i like them, they are rich of particulars, but it's your painting that enhanced them. i had some problems with blogspot some time ago and i highlighted them with the blogspot team; probably they did nothing, but the problems solved in a few days! Thank you so much Luca, that is very kind of you. It would appear that Blogger has sorted itself out again so I can now see what everyone is up to. Excellent job sir. Lovely figures, beautifully painted. I love the orange hair and everything else of course but especially the hair! Great depth and contrast. A thing for red heads eh? I understand they have fiery tempers if scorned! Me thinks that the red head is out of step with the other two wenches. Let me guess, the other two were previously better looking than red and she bewitched them into two horrid creatures. Not a bad guess, ah? You know how woman can be. Nice work Michael. I think you might be onto something there, a wronged witch is probably not a happy witch! Outstanding work again! You really do some awesome stuff. Thank you so much, I just enjoy painting whatever I want. More wonderful work Michael, I do believe you have enough for a game finished! Thank you Terry, can't be far away now, but need some clubmen to get things started. Thank you so much, I'm worried that I might enjoy shopping as much as painting! These look great, the green in the cauldron looks particularly good! Thank you, really enjoyed that bit, great fun getting the bright greens out! Thank you Dean and you were right, Blogger seems to have righted itself. Great figures and a cauldron with an attitude! Thank you Jay, you'll need to be careful stirring that one! What a fantastic set! I think I'm falling under the spell of the redheaded witch. Is there anyone who could resist? I think not! Thank you Monty, you be careful the redhead might not have the purest motives! They look great Michael and I love the character with the sculpts. Thank you Pete and spot on dashboard now visible again - phew! Smashing looking ladies!! Love the look of the pea soup they're cooking up as well!! Thank you Ray, I hear the soup is very tasty, but now one has been able to catch it yet! Wow, what amazing miniatures! You've done them proud too sir! Thank you so much, hugely enjoyable to work on too. Thank you Captain, I have to confess that was my favourite bit to work on too. What a delightful set of old crones! Reminds me of that scene out of the first Black Adder series... beautiful! Thank you Scott and what a wonderful scene that was - great shout! I wonder if they'd be suitable accompaniments to my SAGA Scots...? Thank you Ev and there's an idea - Macbeth the wargame! That's incredibly kind of you Ian, thank you. Well, you made me search for them on eBay! Great looking figs! They are some still there I notice and another pack that is tempting me too. Thank you J.D. the two older ones look scary, especially the one with the rusty blade! That's really kind of you Jason, certainly plenty more in the pile to come. To paraphrase Yakov Smirnoff, "In Scotland you don't stir pot... pot stirs you!" Thank you and there's an image to conjure with!